Paula Rowan was already one of Ireland’s leading stockists of luxury leather goods when she turned her attention to design. For almost two decades she has devoted her career to the finer things in life, and nowhere is this better evidenced than at her stylish leather boutique in Central Dublin. And it was Paula’s knowledge of fine leather, coupled with her background in design, that led her to ask herself that inevitable question – “Why not design my own range of leather gloves?”. But Paula was never going to design just any gloves. Her approach is simple – use only the finest materials, and apply only traditional glovemaking techniques. Paula's commitment to quality is total and her attention to detail is painstaking and so every choice of hide, lining and colour has been carefully considered. Every nuance of stitching and detail has been selected by a master of design. Every design tells its own glove story – some have been inspired by nature, some by art, others by architecture, literature or music. Some are uniquely Irish, others unapologetically international. More than accessories, more than items of clothing, Paula’s gloves are collectors’ items, objets d’art, and little pieces of beauty for your hands. With more than 50 designs, for both men and women, in 25 different colors, some are lined, some are unlined, some are classic, others are daring and contemporary. Some have details, such as fourchettes, points and quirks; others rely solely on the quality of their design and construction. But each pair of Paula’s gloves has two things in common. Firstly, they demonstrate a painstaking commitment to perfection – every one of Paula’s styles is an original design, and is cut and hand-sewn by master craftsmen and women in Italian workshops. And secondly, every glove is made from only the finest Italian leather, because Paula refuses to compromise either her principles or her insistence on quality. Naples is the historical capital of glove-making and Neapolitan dynasties can trace their history in the craft back to the Kingdom of the Two Sicilies when Naples and Palermo were its capitals. Though the industry has declined in recent years, renowned craftsmanship and skills in making gloves by hand for generations are still being kept alive. 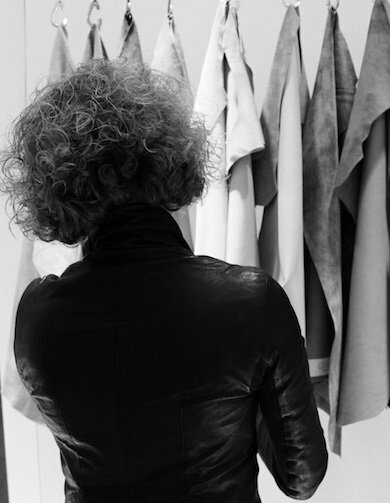 Paula Rowan travels every three weeks to oversee the family-run factories that translate her ideas into leather and whose products replenish her Westbury boutique in Dublin twice yearly and have established her international reputation. There are 14 individual stages in the making of a pair of gloves and every process is done by hand.